Taking orders now on ColoringBook.com. The winning team Obama Biden, coloring book will ship right after this history making event, when the official election results are certified. With RBCB products citizens and family members can color at home while literally choosing their own shade of news," stated Publisher Wayne Bell. Really Big Coloring Books, Inc. (RBCB) of Saint Louis, MO has designed a true to life realistic version of the USA's next "Presidential Coloring Book". In an age where it seems every person can be considered right or wrong about everything, a unique educational coloring book can bring you back to a day of childhood dreams and optimism. What a fantastic amazing country the children of America get to grow up within and set an example for the all the world to see; not only today but for tomorrow and in the future. For over two centuries American elected leaders have set the world stage and as usual, it's very exciting. 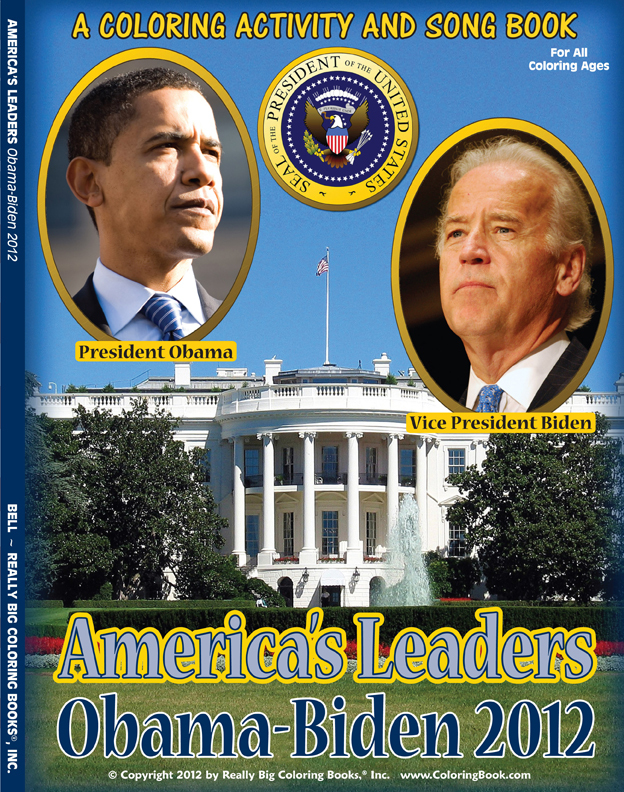 Shortly after the election results are officially certified the company will begin to prepare and ship The 2012 Presidential Coloring Activity and Song Book - America's Leaders. Staff at RBCB are passionate about making coloring books for America and has the greatest respect for Obama-Biden. Publisher Wayne Bell commented, "RBCB understands how an interesting and unique coloring book in a home or educational setting can involve family members in a real discussion about our nation's leaders and the meaning of politics; we bring it right to the kitchen table. Often its heard how some in the media, on occasion, love to color the news; with RBCB products citizens and family members can color at home while literally choosing their own shade of news." 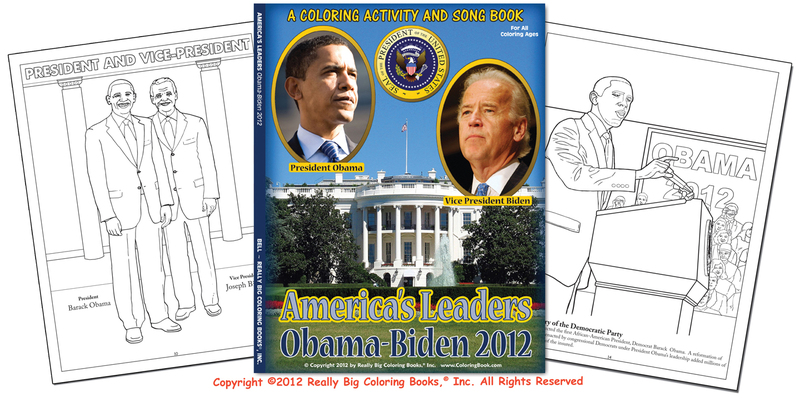 Pre-Order today at http://www.coloringbook.com and get your personal copy, or not, of the next fabulous Presidential 2012 Coloring Activity and Song Book. Designed for adults and kids of all ages, the books are made of high quality materials, exceptional artwork, saddle stitched, and a 36 page volume full of pictures to color, games, puzzles, mazes, activities, songs and more. Included is educational material suited for classroom use thats interesting, accurate and factual. Our office had a lively time making the book and Really Big Coloring Books employs Democrats, Republicans and Independents. Everybody had fun, says Bell. The company has published many political themed coloring books including the historic Yes We Did 2008 President Obama Vice President Biden which sold into the six figures in less than 30 days. Really Big Coloring Books, ® Inc. (RBCB) headquartered in St. Louis, MO is a multinational company providing coloring and activity book products for over two decades. Known for their market leading positions, RBCB'S family of trademarked products are classic, colorful and unique. The company products are multicultural, multilingual and representative of all people. The company uses soy based inks, prints on recycled paper and they participate in Sustainable Forestry Initiatives. With retail, fundraising, custom, educational and creative divisions, Really Big Coloring Books owns and operates over 600 coloring book domain names in several countries. Really Big Coloring Book ® products can be purchased at major retailers, including book sellers many independent locations and various sundry locations.